Fo Guang Buddhist Temple of Boston (FGBTB) is the first temple that Fo Guang Shan Temple established in Massachusetts since 1998. The mission of the temple is to promote Humanistic Buddhism in Great Boston Area and hope that more people knows about Buddhism and apply the teachings of Buddhism in their daily life to experience peace. The center is operated as a Buddhist temple with Main Shrine, meditation hall and library, at the sametime it has a teahouse and a bookstore. The center also organized various Sunday services, interested classes, meditation classes, etc. The center services all range of local communities, especially the professors and students from Harvard University, MIT, BU, BC, and etc. The center also had many interactions with the local Buddhist communities and religious groups. 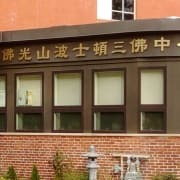 Would you recommend FO GUANG BUDDHIST TEMPLE BOSTON?